In August, I began working with Mitsui Real Estate, Recruit, and a small NGO to introduce a new luxury high-rise residential tower in Shibaura, a less known waterfront area between Shinagawa and Hamamatsucho. It’s near where the base of Rainbow Bridge is located. 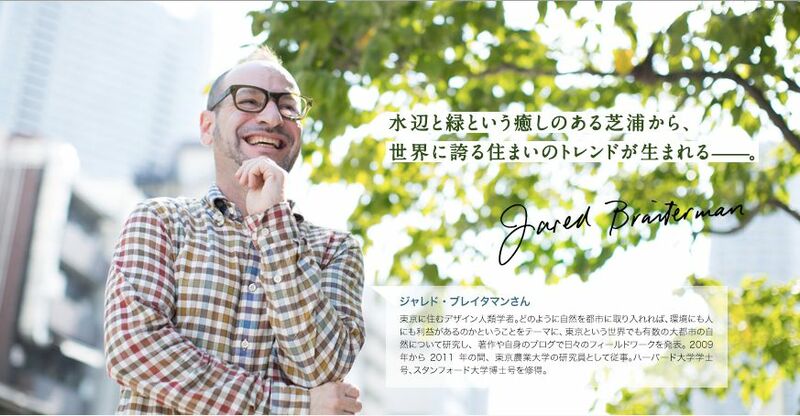 In this online interview (in Japanese) and in real estate brochures distributed around Tokyo, I relate my experience working in the neighborhood at Shibaura House, where I led gardening and fieldwork workshops for locals and international visitors, adults and small children. The new tower, which is just now breaking ground, contributes to the restoration of Edo-era canals by creating a public waterfront park. This park contributes to the developer’s goal of creating a resilient community that includes new and existing residents. Providing greater access to the waterfront also restores a vital part of Tokyo’s history that was neglected in the 20th century. I transport by bike almost all the garden supplies for my balcony garden, including plants and soil. The big box, home center is about 2 kilometers away. Plant Journal Issue #3 includes my article about flower pot gardens in Tokyo. The article also includes interviews with two Nakano gardeners who use sidewalk and wall space to create extravagant seasonal gardens shared with neighbors. You can find stores that sell the magazine worldwide, or order it online. 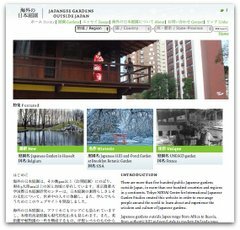 The Japan Times, Japan’s largest English language newspaper, published an interview about Tokyo Green Space online and in print. The interview took place on Marui’s roof garden, and when we met there, a staff member was vacuuming the lawn. A perfect mix of city life and gardening. I hope you find the interview interesting. 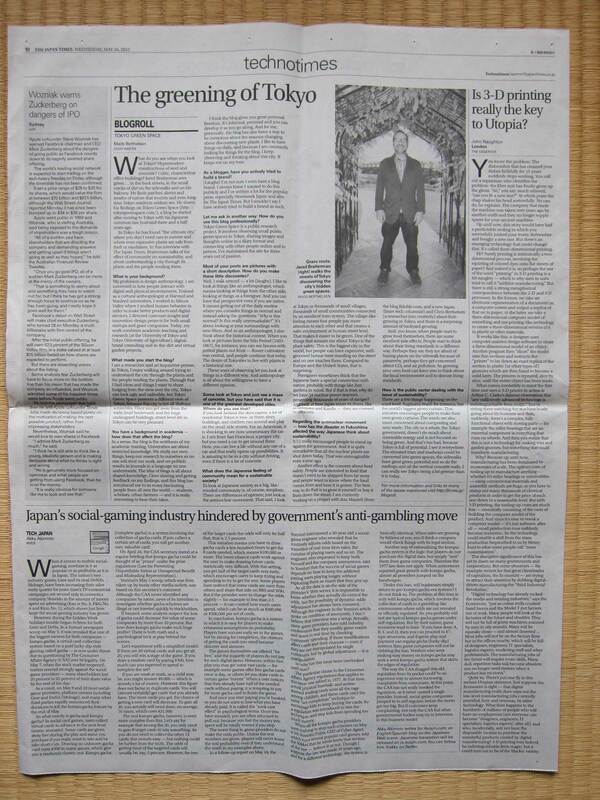 Here’s the print version of the newspaper, where the blogroll interview is positioned on the “Techno Times” page. You can click to make it larger. Walking at night, I noticed that this potted hydrangea is already leafing out, despite recent cold temperatures. It’s lovely to see this plant coming back to life for another season. It’s the mix of continuity and expectation that makes gardening so satisfying. Location: Shinjuku ni-chome, outside of a small restaurant. You can watch a Wayward Plant presentation made at Pecha Kucha London. As all their talks, it is 20 slides at 20 seconds, for a total less than 7 minutes. They will also be participating in the Graham Foundation‘s exhibit, “ACTIONS: What you can do with the city” that presents 99 actions “that instigate positive change in contemporary cities around the world” based on common activities such as walking, playing, recycling, and gardening. It’s in Chicago until March 13, 2010. Encouraged by my host Suzuki Makoto sensei at Tokyo University of Agriculture, I recently visited the Edo Gardening Flowers exhibit being held at the Ukiyo-e Ota Memorial Museum of Art until November 26,2009. The exhibit has spectacular colorful wood block prints showing flowers and plants in a variety of urban settings including kimonos, at festivals, commercials nurseries, educational materials, Kabuki actors, and Noh dramas. An interesting comparison is also made between between the widespread practice of Edo gardening and also the interest of common people in wood block prints. It is wonderful to see the use of flowers and plants in both high culture realms and in depictions of everyday life during the Edo period. Two of my favorite prints are collections of plants used by children to learn the names of flowers. The one below, from the back cover of the exhibit catalog, has the names in hiragana. The exhibit also includes Edo era ceramic plant pots. Some more images after the jump, and also a list of plants seen in the wood block prints. Innovative government projects include Tokyo’s Suginami ward office building. In 2008 the municipal government in 2008 planted the world’s tallest “green curtain” to reduce carbon dioxide, lower energy costs, and demonstrate new green technology. The green curtain covers the south wall of the main city offices, with support from a net nearly 29 meters in height, and a wall of vegetation consisting of fast-growing vines such as loofah, cucumber, gourd and morning glory. The vines are growing in small containers, with a moisture sensor that makes watering very efficient. During summer and fall, the offices are cooler by 4 degrees celsius. This Tokyo ward-level project is an amazing demonstration of vertical urban gardening, but unfortunately little information is available online in English about this project. UPDATE: There’s a fantastic 2010 blog about a Suginami resident creating a small green curtain. Wonderful photos document the progress, lots of information about plant types, and participation of 4 year old child. Very cool!